If you’ve written to let us know how the 30-day challenge is going for you so far, thank you! It’s been great to read your feedback. Like much that relates to the spiritual path, today’s challenge is simple and also very important. 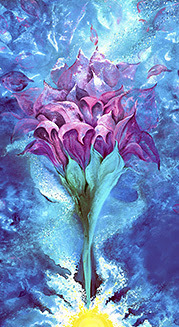 “Crown Chakra Blossoming,” by Dana Lynne Andersen. Right attitude makes it easier to meditate with enthusiasm. No matter where we are (or think we are!) on the spiritual path, the next step is the one that takes us forward. Read the article below to learn or remind yourself of the signs of spiritual progress and of a productive attitude towards them. Then, reflect on the questions at the end of the article. Try not to feel elated or depressed at the answers, but think of how you might improve. The next two challenges, coming in three and seven days, will help you go deeper with Yogananda's Energization Exercises and the practice of pranayama (yogic breathing exercises) — helping you focus your energy and calm your mind. One day a brother disciple of mine, Brother Anandamoy, was asked to dig a deep hole for a septic tank. He dug all day, never stopping to see how far he had come. At the day's end, much to his own and everyone else's surprise, the hole had been finished. "That," Yogananda said, "is the way to find God. Keep on digging and digging, never worrying how far you have come. Then suddenly, one day, you will find yourself there." 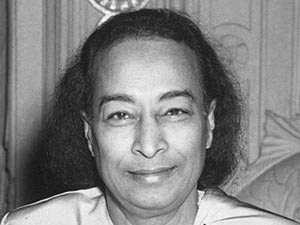 Master (Yogananda) used often to say, “If you plant a seed, then keep digging it up to see how it is doing, it will never be able to grow. You must leave it in the ground, and water it daily; then it will surely grow in its own time. “So also with the path to God: Plant the seed of divine aspiration; don't dig it up constantly to see how it is doing, but water it daily with meditation and with divine actions. See also that you surround it with a protective hedge of good company. In time, your little seed will grow into a mighty tree of Self-realization, affording shade and shelter to every passing wayfarer. But remember, if you dig up the seed constantly you may only succeed in killing it. Doubt is one of the greatest hindrances on the path to God. Yet Master said that doubt also has its constructive aspects. His caution was against indulging in destructive doubts—the "Hamlet," or fence-sitting, complex for instance ("Shall I? Shan't I? Will meditation really help me? Should I try serving in a hospital instead? "); or the attitude of self-judgment, which insists on "keeping an open mind" to every discouraging idea ("I'm sure I haven't got what it takes to get anywhere on the path. Maybe I'm practicing the techniques all wrong, and going backwards instead of forwards. What if this path is only a snare for the unwary, leading them not to enlightenment, but to confusion?") How many—alas, how very many!—devotees I have seen, not only on this but on every spiritual path, wandering dazedly in a fog of such doubts as these. Master, in referring to such people, sometimes quoted from the Bhagavad Gita: "The doubter is the most miserable of mortals." Destructive doubts are their own undoing. It is not possible to advance in any field of action until these mists have been cleared away. They are the fruit, merely, of bad karmas of the past. They must be dealt with vigorously, and not accepted passively in the name of fair- mindedness. A wise person will not offer the hospitality of his home to criminals. Why open your mind to the invasion of thoughts that come only to rob you of your inner peace? Constructive doubt is quite another matter. It is a positive quest for solutions to problems, not a negative suspicion that no solution exists. A runner in a race hasn't time to consider such questions as, "Maybe I shouldn't be doing this," or, "What, I wonder, are my chances of losing?" But he may consider more practical questions: "Shall I lengthen my stride now? Is it time yet for my final sprint?" The true devotee, like the true athlete, concentrates on doing the very best he can. With such an attitude defeat is impossible; there can be only varying degrees of success. The signs of spiritual progress, then, can be considered constructively only as guidelines to present endeavor, and not as depressing reminders of how far we still have to go, nor as ego-balm for the semi-enlightened. One of the most common, mistakes on the spiritual path is to equate progress with psychic phenomena of various kinds. Visions, voices, and other mental or psychic phenomena are no sign in themselves of genuine exaltation of consciousness. Swami Sri Yukteswar said that many devotees renounce worldliness only to seek it again on the subtler level of astral phenomena. The basis of all true progress is right attitude. If you are becoming more kind, more self-giving, more calm, you may be sure that you are progressing whether you see visions or not. If you are succeeding in relinquishing your likes and dislikes, and are learning to accept even-mindedly whatever experiences life sends you, then you have much cause for rejoicing. If you find that you have fewer and fewer desires for the things of this world, know that you are truly finding freedom. And more important still, if your love for God is growing ever deeper, know that you are fast approaching Him. And if through all the trials of life you always feel joy inwardly, a joy that nothing can shake, know that you have Him already to a wonderful degree. "But my attitude seems to be improving," you may argue, "and I certainly can't boast about my 'divine contacts' in meditation!” My friend, this kind of negativity is the very thing I warned against at the outset of this article. Digging up the seed to see how it is growing — remember? You'd better give thought first to that attitude, lest it cancel out all the others! How do you know that you have had no divine contacts in meditation? The very fact that your attitude is improving is sign enough that something is happening. What then have you been expecting? Lightning? Thunder? Parting curtains, and a chorus line of angels? Jesus Christ said that God comes "like a thief in the night." Greater things than what you now experience will surely come to you in time, but know that one's very love for God in meditation is already a sign of His presence. That's just His way: He likes to steal in by the back door. One of the most difficult things for people to do, so doctors tell us, is correctly to diagnose their own illnesses. How much more difficult is it to assess correctly one's own spiritual delusions! People hardly can determine for themselves whether their illnesses are improving or worsening. ("Doctor, how am I doing?" is the first question they generally ask when they visit their doctors.) How much more difficult it is to determine for oneself whether or not one is advancing spiritually. The gains are very rarely evident from one day to another, but become felt rather over periods of months, even of years. Do not allow yourself to become overly impressed when someone says to you, "I attended this spiritual gathering yesterday, and the inner growth I experienced wasfantastic!" Life's peak experiences must be balanced against the subsequent troughs before a true assessment can be made. Sometimes there are days, even moments of sudden growth, but it isn't usual, and even when it occurs it is usually because the ground has been long and carefully prepared beforehand. Much time is wasted in any case, as I said earlier, in analyzing one's degree of spiritual progress — time that might have been better spent in meditating and advancing still further. The most important thing to bear in mind is that what truly matters is not what God is giving you, in terms of visions and consolations, but rather what you are willing of yourself to give Him. Often it happens that a weak and worldly soul, more in need of encouragement, is given more experiences than one who is purely self-giving. In any case, don't seek experiences for their own sake. I don't mean not to be grateful when they are given to you, for a grateful heart is one of the best signs of right attitude. I mean only not to seek such experiences, not to be attached to them. As Master said, "The path to God is not a circus!" If I seem to be slighting deep, meditative experiences (as distinct from merely psychic phenomena), it is only because right attitude must be the foundation of such experiences. Every path to God has its own pitfalls. The special pitfall on the path of raja yoga is the temptation to spiritual pride as a result of one's meditative insights or new-found miraculous powers. Yet to talk only of right attitude and ignore the soul's inner unfoldment would be a mistake, too — an invitation to the devotee to rest comfortably on his oars, and be content with a journey but started. Right attitude itself should lead one to want to come ever closer, consciously closer, to God. Master met a monk once and asked him, "Do you ever see lights or angels in meditation?" "When God wills it I shall see those things," replied the monk. "That is not so," Master told him, severely. "When your devotion is right you will see them. God has hidden those things from you, not because He wants to, but because your own devotion is still lackluster." Once pure love, and not a desire for miracles and phenomena, becomes the basis of our spiritual search, we may expect certain phenomena to attend us even though we desire them not. If they remain too long absent, it is a sign that something is lacking. Pray then for more devotion, not for those mere fruits of devotion, lest you fall into the error of the starving man who prayed for a large stomach, instead of a full one. But again, bear in mind how subtle the inner world is, and don't wish for lights merely because others see lights, when God is already showering you with another kind of abundance. Many are the inner paths to God. Some people advance very far and never see lights of any kind. Master's words to the monk therefore should be taken in part as personal counsel, directed to him alone. The important thing is that God's presence be actively experienced in one form or another. God comes to the soul in different ways — as light, or sound, or love, or peace, or intense calmness, or power, or wisdom, or divine joy. One may advance by any one of these paths or by several, but one seldom advances by all of them together until the higher stages of sadhana (spiritual practice) have been attained. One who sees lights may have visions of saints or angels, or of the astral world. One who hears sounds may hear astral music, or the sounds of the spinal centers. One who feels love may find tears flowing inadvertently in meditation. One who feels peace will feel as though he were drinking it in pure, life-giving draughts. One who feels calmness (the positive aspect of peace) may feel his consciousness expanding as if into a vast hall. One who feels divine power will be made intensely aware that God alone is the Doer, that man's own power is simply non-existent. One who experiences wisdom may develop deep insight into any question he asks of God, or he may know himself inwardly as the undying Self. And one who experiences divine joy will never want for anything else. But to go deep into any of these experiences, the little ego must be forgotten. So long as one still has the consciousness that he is meditating on them, his meditation will be imperfect. The meditator, the act of meditation, and the object of meditation must become one. For this condition, the first requirement is that the mind be held steady. (A state of excitement renders deep inner experience impossible.) The next requirement is that the breath become calm — indeed, motionless. Once the breath ceases (not by holding it, but as a natural consequence of physical and mental calmness), the thoughts, too, must cease altogether. Until this state is reached, deep spiritual experiences will not be possible. One who sees light should concentrate not so much on visions as on entering the light himself. Concentrate on thecenter of whatever light you see at the point between the eyebrows. If you see the spiritual eye (a circular blue field surrounded by a golden halo, and having a white, five-pointed star in the center), that will be better still. Concentrate on the star if you see it, or in the center of the field of blue. Gradually the gold will expand and form a tunnel. Passing into this tunnel, you will consciously enter the light of the astral world. In time, the blue light will form a tunnel. Entering that, you will enter the light of the causal world, the Christ Consciousness. When you can penetrate the star in the center, you will enter the Spirit beyond vibratory creation. I have described elsewhere the sounds of the spinal centers. It is better to hear these sounds than to hear astral music, and better still to hear the sounds of the higher centers than those of the lower. But best of all is it to hear, and merge into, the great sound of Aum. One who feels love should seek perfect union with the Divine Beloved. Devotion (bhakti) will not develop into divine love (prem) until it expands beyond ego-consciousness. And so also with the other experiences of God: Always they should be offered up to Him, that they take one ever deeper into His consciousness, lest one rest satisfied on a mere ledge, and never reach the mountain top. Above all, never compare yourself with another, lest you fall into either discouragement or pride. Don't even dwell too much on the signs as I have described them here. I have but scratched the surface. God, who is infinite, can come to the soul in an infinity of ways — as exquisite smells, as a thousand sweet tastes crushed into one, as divine instruction, as the purest divine merriment, as the tenderest imaginable forgiveness. Each soul's relationship with the Infinite is unique. Compare yourself not with others, but only with your own self: Do you love God more now than you used to? Are you developing even-mindedness? 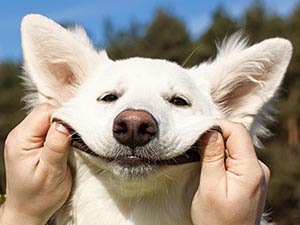 Are you more inwardly contented and joyful — or at least happy? Are you renouncing self-will? Do you want to serve and please only God? If your answer to these questions is Yes, and if you can add to your answer the wish to grow daily in these sublime virtues, know that God and Guru must be well pleased with you. Offer yourself into their arms. They will bear you surely and swiftly to the Divine Shores! Do you feel you are not making spiritual progress? The first thing to do is to take stock of yourself and find out what is standing in your way. This article suggests nine keys to help you move forward. The fact that yoga practice accelerates one’s spiritual progress only increases the need for right attitude. One may have right attitude and know nothing of yoga or of meditation, and still reach God, eventually. But without right attitude, lifetimes of yoga practice may develop nothing but spiritual pride.